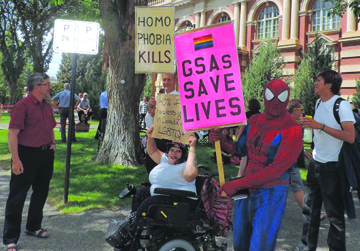 Southern Alberta Newspapers file photo Demonstrators wave to cars in front of the Medicine Hat court of Queen's Bench where an application for an injunction against implementing provinicially-mandated requirements for schools to host Gay Straight Alliances was rejected. A request for an injunction to immediately stop Alberta’s gay-straight alliance law has been denied. The Justice Centre has represented multiple faith-based schools, parent-interest groups and individuals who wanted an injunction against Bill 24 until its constitutionality is ruled upon. Bill 24 requires schools to allow GSAs if requested by students. The peer-support groups are meant to ensure LGBTQ+ students feel safe and welcome, while also preventing bullying. One of the most contentious parts of the law is that parents cannot be notified of their child joining the GSA, unless the child consents. Advocates and the provincial government argue this protects children whose parents would not be accepting of their sexual identity. At a hearing on June 20 in Medicine Hat, the Justice Centre argued the law violates charter rights of parents, religious freedom, harms children and jeopardizes school funding and accreditation if schools don’t comply. In her decision, Kubik said there is a serious constitutional issue to be heard about the competing charter rights of parents and children, but when other factors are weighed, an injunction should not be granted. “I find that the applicants have failed to prove a degree of irreparable harm, which outweighs the public good in maintaining the legislation,” she said. Kubik said there was no evidence sexually explicit materials ever came into the hands of any students through a GSA, nor that there’s a risk of this material being disseminated to students in GSAs, as is alleged by the Justice Centre. The Justice Centre made submissions that two children were driven to suicidal thoughts after joining a GSA and being “convinced” they were transgender. Kubik found that requirements of school boards to make attestations that they are following the regulations and publicly posting the policies doesn’t make them forsake their religious principles or teachings. “It merely requires them to evidence their compliance with common public interest values, honour the Alberta Human Rights Act by not discriminating, treat people in accordance with Charter values, and publicly state that they will provide all students, including LGBTQ+ students, with a welcoming, caring, respectful and safe learning environment that respects diversity and fosters a sense of belonging,” she wrote.